Get paid to write Yelp reviews. 10 minutes. $20 per review. Must already have a Yelp account that is at least 6 months old with activity on it. This is proof that, as with all good things, people have figured out ways to take advantage and scam an otherwise good system. Luckily, Yelp is not sitting back idly watching their service get watered down. Instead, they’re actively making changes to combat such fraud and punish businesses that won’t play by the rules. Yelp then keeps the alert on the company’s page for 90 days. At that point, should the business not get caught up in anymore shady schemes, Yelp removes the alert. The hope is that the public shame will be enough to scare businesses away from review-buying scams. Will people keep paying people to write them reviews? Of course. No matter what Yelp does, someone will game the system. It’s just like SEO. People find and jump through. As soon as the loopholes close, they search and find another one. Many get caught, but others are fast enough to keep it up. But what can you learn from all of this? Well, basically what it comes down to is that it’s not worth it. You have to weigh your options here. Is taking a chance on suffering public humiliation worth buying a couple of good reviews? Consider this, if you get caught and that alert gets placed on your page, the hurt will last much longer than the 90 day period that the alert is visible. Consumers will see it, tell their friends and post it all over Twitter and Facebook, and your reputation will be mud. 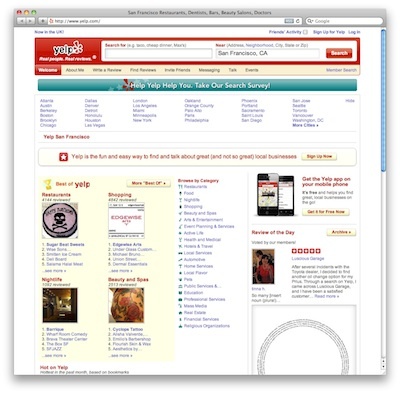 Your best option for using Yelp is to offer great customer service and let customers know about your Yelp presence. Will everyone give you 5 stars? Of course not. But let’s be honest—no one expects perfection. What about the Yelpers who accept cash to write fake reviews? Should they be punished too? Discuss!